Okay, so I set up a myspace account. I did this mainly because we don't have a listings magazine anymore (though apparently Time Out were up here "prospecting" last week), and I was having a hard time with the old forward planning. I mean, Roy Ayers played at the Mint Lounge, for chrissakes, and I didn't know until it was too late. And there are also some artist collectives/events organizers/interesting folks who don't send out press releases, but do all of their promotion and dissemination through myspace. Plus, I was curious. Anyway, it doesn't matter how good my reasons for setting up an account are. My friend Chris still snickered at me and called me a "cool chaser." And, it also doesn't matter how lame myspace actually is (which, um, it is by the way. For one accustomed to the clean Habitatesque Minima-lism of blogger, a visit to myspace is like a trolley dash round Walmart on a muggy Saturday afternoon,) I am now inextricably bound up in the life cycle of a trend, rather than standing on the sidelines rolling my eyes and making wisecracks. It feels cold, and a little scary. 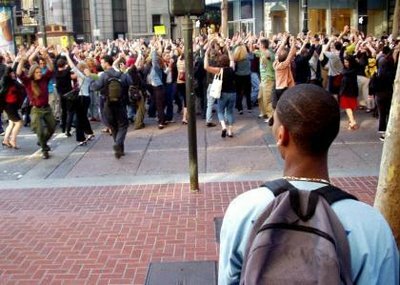 Which reminds me of an excellent story I'd like to bring your attention to - the tale of the rise and fall of the Flash Mob, once catnip to hipsters, by Bill Wasik, the man who created them in order to study the life cycle of a trend. Read it and eat your pseudo-ironic trucker hat. UPDATE: Forgot to say that I did not take this picture. I wish I had, but I pulled it off a news story that has since disappeared. Wow, Time Out eh!? T'would be marvellous indeed if they started publishing a Manchester edition. Time Out used to publish a Manchester edition in the early 1970s. I used to write record reviews for it. The headquarters were in a little office in Kennedy Street (just behind Princes Street). And the editor was - wait for it - Jeremy Beadle. Roy, I didn't know this until just recently when I found this http://www.ibiblio.org/mal/MO/philm/friends/timeout.html whilst snooping around online. Its interesting as this seems to suggest that the mag failed because the region had little coherent identity. They lumped Manchester and Liverpool together, and it failed because people didn't think of themselves as Northwesterners. I wonder if this has changed? I almost went to a flashmob. It was a flashmob hatting actually. All meet in Picadilly Gardens at a certain time not saying anything, then all at this appointed time suddenly put on a hat, stand still for a sec, and move off quietly. It REALLY appealed to the funny in me. But then i couldnt be arsed. Because i'm also very lazy. I thought City Life mag was a part of Time Out? Or Metro? Or something? Nah Fluff, city life was owned by Guardian Media group, which also owns the MEN - that's probably what you're thinking of. I managed to avoid the flash mobs but I was in NYC during their heyday and it was very, very silly. Trendmongers aside, the absurdity of the stuff they would do - mass pillow fights in public. for example - was kind of endearing. awwww well its a better more vanilla cult maybe.. those pesky mass suicides really cut into commuting and i bet it has better dental.